Staying up all night at the club is not for everyone. Especially if you’re a crowd-averse introvert. You like a quiet night in binging the latest show on Netflix and having a quiet dinner with perhaps one person or a beloved animal. There are times when you’d perhaps want to have meaningful interaction with other people. Even if you’re more extroverted, it’s nice to be able to save money and have something to do at home rather than out on the town. The solution? Fun board games for adults. That’s right ladies and gentlemen, thanks to some great game designers, board games as a kids-only activity is a thing of antiquity. Keep reading to learn more about five board games to pick up and enjoy with your adult friends and family. If you’ve found yourself killing time in a Target recently, then you’ve probably seen this simple black box full of hours of inappropriate fun. Not for the faint of heart, this is probably the most offensive game you’ll ever play. With the right people, however, this is the perfect game to turn off your brain and have fun with friends. Similar in style to another popular party game (Apples to Apples), it’s easy to learn and always a fresh experience. Perfect for a small group of friends, especially when you’re on the go. Basically, a potentially NSFW version of hot potato as you avoid the exploding kittens and pass the consequences off to the other players. There are many versions of this game, but there is an NSFW version if you’re interested in adding some more adult elements. Are you more of a competitive, strategic thinker who dominated at Monopoly and Risk as a kid? Then, Settlers of Catan is the adult board game for you. Considered by many to be one of the greatest board games of all times, get ready for unending hours of farming, mining, shepherding, building roads, and building armies. The gameplay is always fresh and can expand in the several expansions sold separately. What makes Pandemic unique as a board game is it’s 100% cooperative. Your mission (should you choose to accept it) is to stop the outbreak of a global virus. You and your friends have different roles you must use in tandem to stop the contagion before it’s too late. If tensions are already high within your social circle, avoid competition and force them to save the world together. Light some candles, turn on some scary music and sit down with loved ones for a truly fun and frightening game experience. Think of it as Dungeons & Dragons Lite. You assume the identity of a hapless traveler into a haunted house. As you explore, a haunting occurs, turning a member of your party against you. You must come together and defeat the evil the traitor has awakened before the traitor defeats you. A great game for bringing a party up to full speed. It brings the introverts out and extroverts really shine. Wink at different players around the table to signal that you have their card. They have to signal the location that they have the card for. All of these winks and signals have to done secretly so that no other players can intercept. 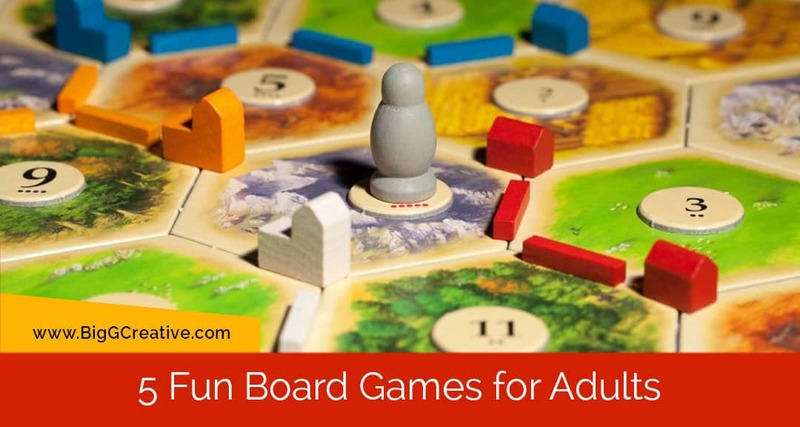 Want More Fun Board Games for Adults? Had enough of these games? Try out some fresh, fun board games for adults from Big G Creative. There’s something for everyone with these fun and easy to learn party games. Take a look at what they have to offer, and be the first of your friends to have the fun, new game on the block.